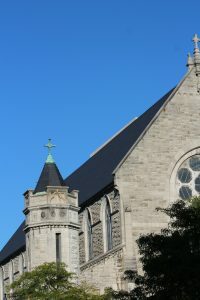 North Country Unfading Black roofing slate was selected for the Cathedral of Immaculate Conception, located at 259 E Onondaga Street in Syracuse, New York. This grand Victorian Gothic Revival style church and the focal point of Columbus Circle. 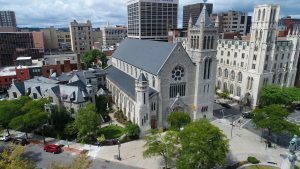 Originally built in 1874, the Cathedral of Immaculate Conception underwent a $12 Million dollar renovation in 2017. 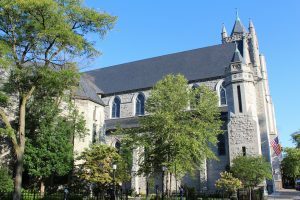 Fundraising for the cathedral’s third major renovation began in 2016 with $11.5 million raised from cathedral parishioners. 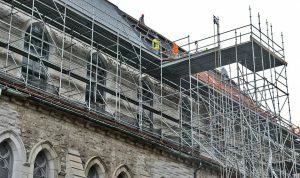 Monies raised paid for new slate roof, electric and heating system replacement, restoration of main and side alters, updating cooling and ventilation systems, window replacements and a new elevator. 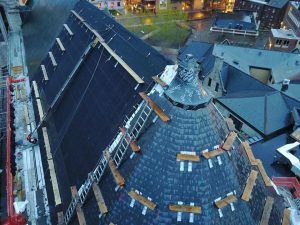 In 2017, we supplied 134 squares of our North Country Unfading Black, 20” x 12” x Medium Texture roofing slate for the re-roof. The same slate was supplied in 2009 for the church’s Rectory. A medium textured slate was selected for this re-roof providing more definition in the appearance of the roof and at an economical price. 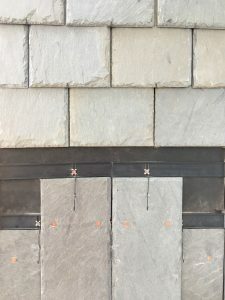 Medium texture slates thickness varies from ¼” to 3/8” and weighs between 950-1000 lbs per square (one square covers 100 square feet of roof area). This slate meets the ASTM requirements as an S-1 rated roofing slate and are available on a first-come, first-serve basis when in stock. Produced in St. Marc Du lac Long, Quebec, Canada, this quarry was discovered when the transcontinental railway was built at the beginning of the 20th Century. An open cut slate quarry, the deposit is located along a dark gray slate bed. In 1997, North Country Slate was appointed by the Glendyne Quarry as the exclusive North American distributor of this unfading black roofing slate. 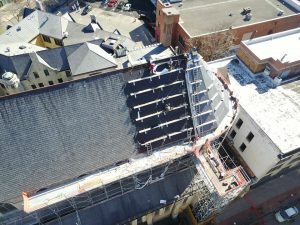 Slate installation on the Cathedral of the Immaculate Conception was a non-traditional method hook system which is popular in Europe. This system requires nailing a roofing strip and hanging the slates on the hook. The traditional North American method of installing slate uses two nails secured into the decking. Next time you’re in Syracuse, New York be sure to check out the Cathedral of the Immaculate Conception.